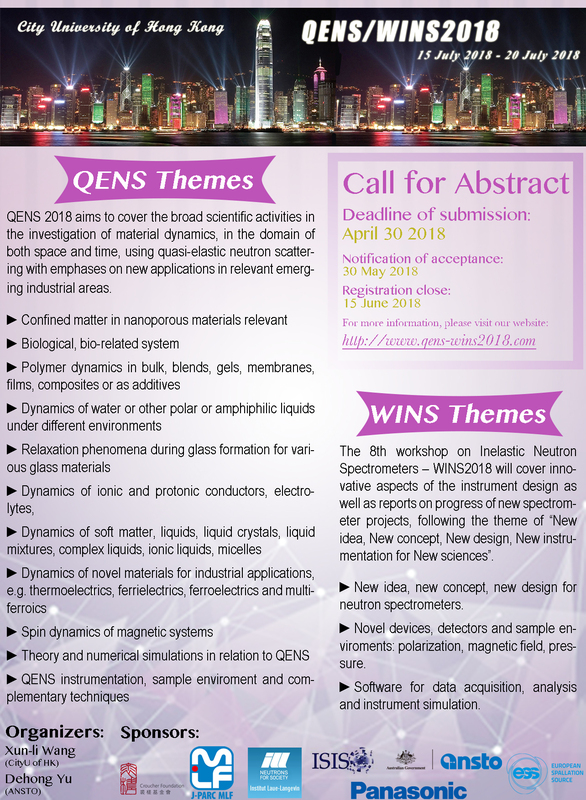 QENS 2018 aims to cover the broad scientific activities in the investigation of material dynamics, in the domain of both space and time, using quasi-elastic neutron scattering with emphases on new applications in relevant emerging industrial areas. It will offer a platform for discussion and exchange of scientific ideas among the experts in this field. It will provide an overview to newcomers about the capabilities of QENS in exploring dynamic and relaxation processes of novel materials. The 8th workshop on Inelastic Neutron Spectrometers – WINS2018 will cover innovative aspects of the instrument design as well as reports on progress of new spectrometer projects, following the theme of “New idea, New concept, New design, New instrumentation for New sciences”. New development of sample characterization such as polarization, magnetic field, pressure will be covered. Software for data acquisition, analysis and instrument simulation will be also part of the program. Participation of the young scientist is particularly welcome. New idea, new concept, new design for neutron spectrometers. Novel devices, detectors and sample enviroments: polarization, magnetic field, pressure. Software for data acquisition, analysis and instrument simulation.